Walk-in tubs usually need a bigger space than your average tub. Not only is the bathtub itself bigger, most handicapped seniors also need enough space in the bathroom for easy access with a wheelchair. Some of these mobility tubs are designed exactly with a small bathroom in mind. An elderly person that has a small bathroom can fall and break bones as easily as one who has a big bathroom. When looking to fit a walk-in tub in a small cavity or alcove, we have to look for a small and compact bathtub that has appropriate features to fit in such a small space. The tub itself should be small. Rectangular or cube tubs are usually the best. Inward swing door. Most bathtubs for the elderly have a door that opens outward. If you lack the space, an inward swinging door is perfect. No fancy features like hydro or air jets. Installation-wise, every kind of jet needs additional motor and electricity that has to go somewhere. The installer has to break additional tiles, make tile flanges and all this is a smaller amount of space. Small. With an inward swinging door. Simple. Dimensions of a standard bathtub with doors for elderly is very similar to the size of an ordinary tub. It has a capacity of about 60 gallons, with dimensions of 32” x 52” x 38” (width x length x height). Chances are that you’ll hardly find a walk-in tub with a width below 32”. Opting for 28” width in the best you can do. Where can you really save space? Reducing those 52” of handicap tub length is something you can do. If you look around for a small walk-in tub, you’ll see that you can find one with a length of about 38”. That saves more than a foot of space in the bathroom. Finding the smallest walk-in bathtub for seniors will also save you money when it comes to the installation. The number of tiles installers will have to break will be reduced by more than 20% if you go for a rectangular tub. Height, on the other hand, the height doesn’t really need to be reduced. The height of the small and bathroom are usually the same. In fact, choosing a small tub but the deeper walk-in tub will give an elder more space in the bathtub. The number of square feet you dedicate to a tub, however, will be minimum. 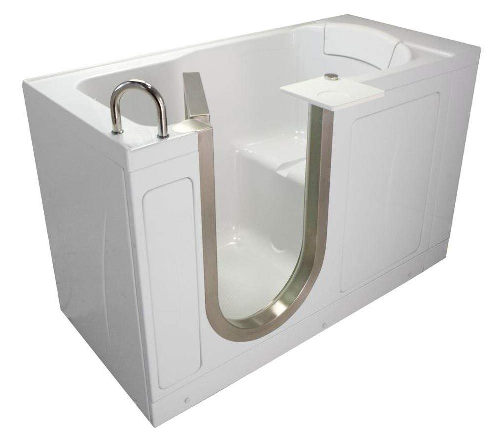 Meditub rectangular tub is only 38” in length. It occupies more than 25% less space than a standard walk-in tub. 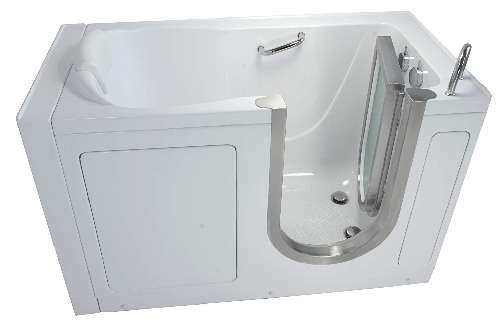 Most of the standard-size and bigger accessible tubs have an outward swinging door. That can be convenient for a bigger bathroom, but if you lack space in the bathroom, every square foot counts. One of the best features is the inward swinging doors. The bathtub door simply swings inwards instead of outwards. That frees quite a lot of space in front of the walk-in tub but it doesn’t impede on the ability to have an enjoyable bath. Given that door itself can be 15” wide, it really is impossible to install a bathtub if bathroom space is scarce. This is especially useful if you have a narrow bathroom. Not many producers offer inward swing doors for their sitting tubs but it is quite important that such doors are included in the design of the smallest walk-in tub. Petite soaking tub with an inward swing door. Only 28” wide and perfect for a narrow bathroom. A lot of sit down tubs feature different add-ons such a hydrotherapy and aromatherapy. Those don’t add to the protection of the elderly but they do make installation more complicated and require additional space. All the hydro and air jets have to go somewhere in or underneath the bathtub, adding to its size and increasing the space required for a walk-in bathtub. Of course, they are also more expensive than smaller tubs. A high-quality hydrotherapy walk-in tub can set you back $10,000 while you’ll easily find a simple and compact one for less than $5,000. For basic taking-a-bath functionality for seniors, one does not need to spend that much space or money. 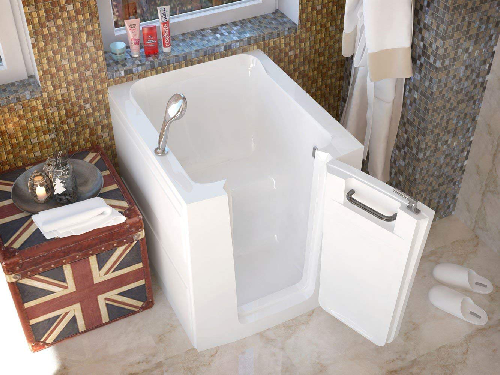 The best smallest walk-in tubs have a simple design and should neatly fit in the smallest bathroom alcove. Ella Deluxe bathtub is simple and easy to install. It also has an inward swing door and a price tag of less than $3,000.